Thank you for subscribing to my monthly e-newsletter. I hope everyone is having a wonderful Spring season. There are many exciting upcoming events, exhibits and promotions for Mother’s Day as well. Please keep us in mind for your gift giving needs. Please share this with your friends/family through email, on Facebook or Twitter. SPRING CLEANING SALE – 20% OFF! If you would like to purchase any new art for your home or office space, contact me to inquire on the following artwork, naturallyinspiredartanddesign@gmail.com. Take a look at my on-line portfolio to view some of the options available. 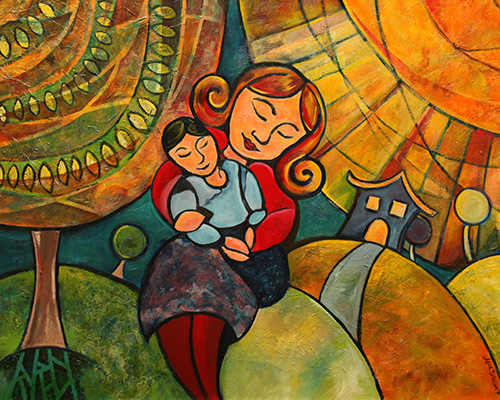 ORDER A “MOTHER AND CHILD” PRINT OR GREETING CARDS CARDS FOR MOTHER’S DAY! Mother and Child” is a mixed media work of art created on canvas. This piece is a perfect gift for all mothers. his 8×10 or 16×20 matte print featuring Mother and Child by Naturally Inspired Art and Design is printed on high quality 100lb matte stock paper and trimmed to artwork. In honor of MOTHER’S DAY we will be offering a 20% discount throughout the month of APRIL. 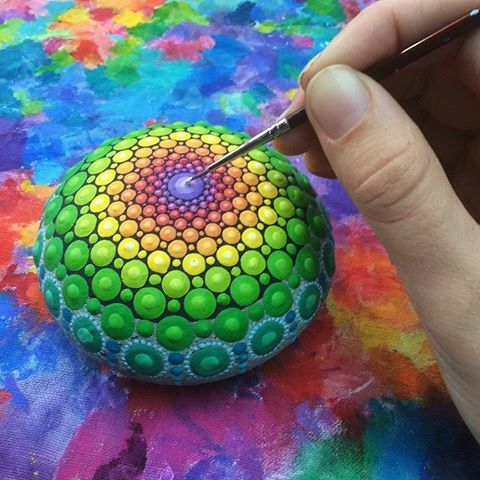 Painted stones by Elspeth McLean,Elspeth McLean is an award winning artist born and raised in Gooseberry Hill, a small leafy suburb in the foothills of Western Australia. Since a child, Elspeth has expressed her ideas, experiences and passion for life through art. Check out Elspeth McLean’s Facebook page, click here. This artist in the image below is from Rio Verde City in Goiás State, Brazil. 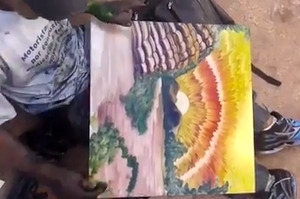 While the artist’s name is unknown, you may see more of this video by clicking on the image below. Thank you for subscribing to my monthly e-newsletter. I hope everyone is having a great start to the 2015 year. There are many exciting upcoming events, exhibits and promotions for Valentine’s Day as well. Please keep us in mind for your gift giving needs. Please share this with your friends/family through email, on Facebook or Twitter. W62 N546 Washington Avenue, Cedarburg, WI 53012. Works created during the Live Painting Event will be available by silent auction throughout the exhibit duration of February 7 through March 22. Come watch 6 local artists create magic before your eyes! 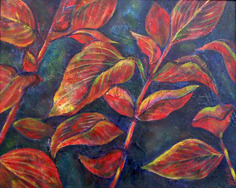 The CCC’s Annual Juried Exhibit is a premier fundraising exhibit and sale for the non-profit Cedarburg Cultural Center. 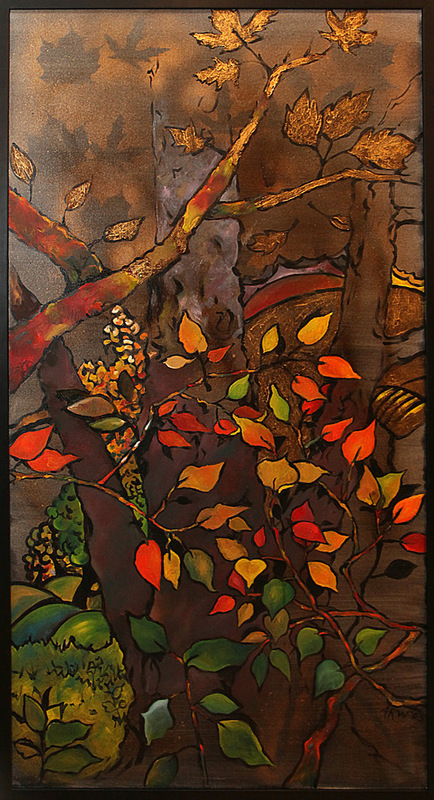 Five of my custom made batik works of art (framed with maple wood) will be on display. In honor of Valentine’s Day we will be offering a 20% discount throughout the month of February. 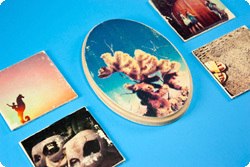 If you are looking for a fun DIY project this Winter season, consider making a keepsake to hang on your wall or using as coasters using natural wood and a photograph. For more instructions on this project, click here. Thank you for all your support over 2014. 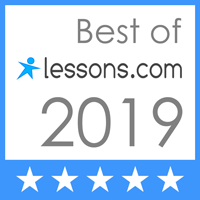 This past year has been a wonderful year, full of exciting projects. The year came to a wonderful close by fulfilling custom holiday gifts for my client’s friends and families. I have included a couple of projects I completed below along with my monthly textile painting/dyeing technique as well. 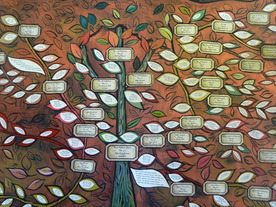 The client wanted to create this family tree to be customizable in order to add additional leaves for new grandchildren. I created leaf placeholders within each of their children’s branches and affixed an envelope containing blank leaves to be filled in and added at a later date. This project challenged me to think outside the box and create a work of art that honored the husband and wife’s respective family members while celebrating the newest leaf to their family tree, their grandson born on 9/3/14. I was commissioned to create a custom 35″x35″ silk scarf using a mixture of techniques, such as serti and batik, to create a one-of-a-kind design for a woman’s 70th birthday gift. The clients provided me with her personality and style. The clients and recipient were very pleased with the final product. 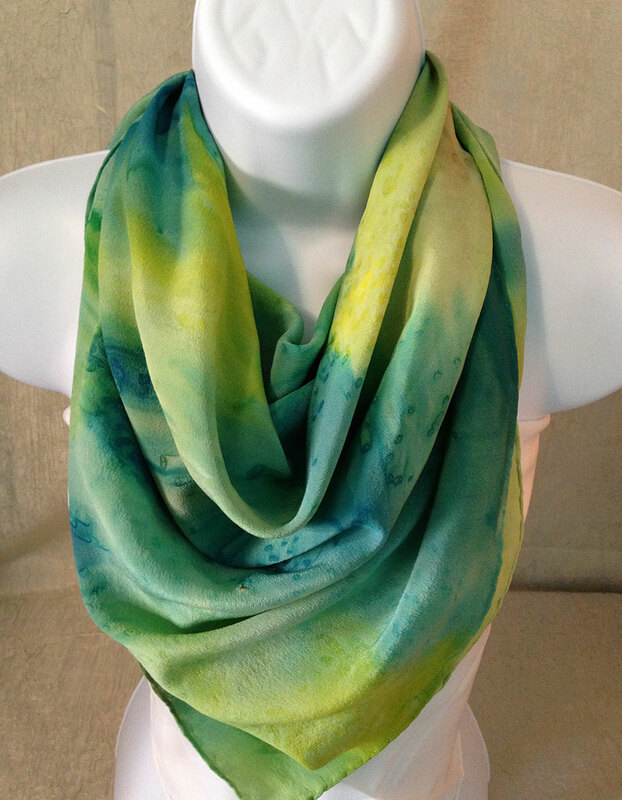 If you would like to create a custom silk scarf for a family and/or friend, contact me with your information so I may provide you with a quote, click here. 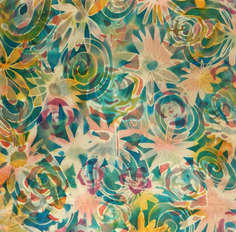 This technique is a fun variation of traditional batik dyeing techniques. 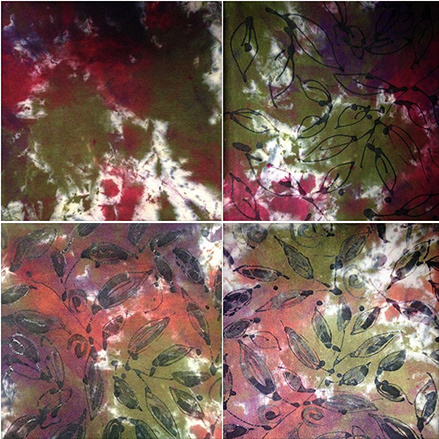 Step 1 (Top-Left Image): This bamboo/cotton combination fabric was hand-dyed using procion dyes. It was set with soda ash to dyeset this fabric. Step 2 (Top-Right Image): This fabric was stretched on a frame. I applied hot paraffin wax using a tjanting tool, commonly used in batik. Step 3 (Bottom-Left Image): I applied more hot wax using a standard synthetic brush to fill in the areas inside my design. This will help to maintain the original color before we move on to Step 4. Step 4 (Bottom-Right Image): I took a spray bottle and mixed 1 part water to 3 parts bleach. I sprayed this mixture throughout this fabric. Once the color begins to fade (10min.) I washed the bleach solution off of this fabric. Then we’ll proceed to Step 2 again until the fabric design is complete. We have fine art, silk and cotton scarves available for purchase. Our on-line gallery contains a variety of fine art containing mixed media, acrylic and water color. The mural gallery contains images of work done in an office buildings in Whitefish Bay, WI.